being a teacher | Adventure Awaits! Yesterday was the 5-week mark of my arrival in Guyana!! That means only 7 more weeks to go! I can’t believe how fast the time is going! I am really enjoying my time here and am learning a lot about what life is like in Guyana every day, as well as a lot about myself! I’ve been teaching the Grade 3 class at the primary school three days a week, and helping out for parts of Monday and Tuesday. The kids are starting to settle down a bit as they are getting used to our presence in the school, and I am finding my job as a teacher a bit easier with each day of practice. I’ve discovered that being a teacher is certainly NOT an easy job – regardless of where you come from or what country you are teaching in! That’s definitely something I learned very quickly in this environment! Coming from a family of teachers, I thought I understood fairly well the difficulties that teachers face and the amount of work and effort that goes into teaching, but coming here REALLY opened my eyes! Imagining what it must be like was one thing, but actually living it is a completely different story!! Not only have I found out how draining it is to try to keep 25-30 Grade 3 students occupied for a whole day of school, but I’ve also discovered how difficult managing a class is!! I thought back to all the teachers I’ve had in the past who struggled to keep some rowdy classmates under control and focused on a lesson, and I could really sympathize with them! 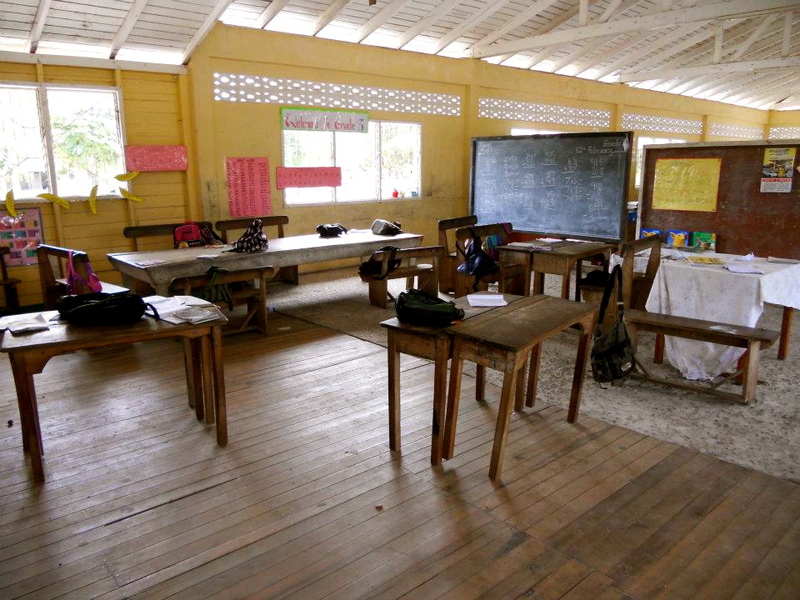 Not only am I trying to teach in a completely new environment, but also in a country where the education system and standards are foreign to me. Teachers here seem to rarely leave lesson plans for substitutes if they are going to be away, which has probably been the hardest part for me, because I have no background in teaching and have never written a lesson plan in my life! We usually have very little idea of what the students have been learning, what level they’re supposed to be at, and what level they might actually be at in any given subject, so it definitely makes teaching that class for the day a challenge to say the least! There are schemes written by the Ministry of Education that usually list about one topic per week for each subject, so we have been doing our best to follow that for the Grade 3s and to come up with some lessons that the majority of the students might be able to follow. Fortunately, the challenging parts are balanced out with the laughs and smiles that the kids bring me each day. I spent about half an hour the other day taping all of the pictures that the Grade 3s have drawn and coloured for me, and the notes they’ve written me over the last couple of weeks to my wall! Some of the kids also give me hugs before they go home for lunch and at the end of the day to say thank you and goodbye for the night! It’s adorable and takes any frustration I’m feeling away pretty quickly! Getting rained on in the rainforest! In other news, I can now say that I have slept overnight in a hammock in the jungle and survived a big rain/wind storm in the middle of the night!! One of our Guyanese friends took us camping at the creek where we go to bathe last weekend! It was a lot of fun! 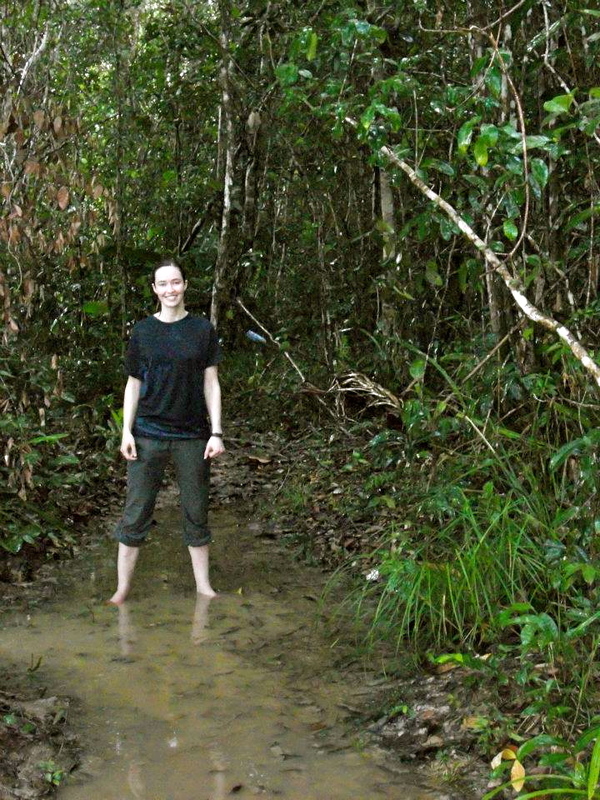 We went for a rainforest walk before dinner and it started to pour – how fitting! I got some pictures taken of me being rained on in the rainforest! In the morning, one of the locals gave us a fish he had just caught out on his fishing trip so we could fry it for breakfast, and it was delicious! Unfortunately (or maybe not that unfortunately! ), we didn’t get to see any jaguars in the middle of the night, but we did manage to spot a fox who was interested in stealing some of our camp food!! It was sometimes hard to distinguish any real wildlife from the many stray dogs that are constantly roaming around all parts of the village, but we’re pretty sure one of the creatures was a fox! I probably would have preferred to see a jaguar, but then again, I may not have made it back alive to tell the story if I had! On Saturday we took a road trip to another region of Guyana called Berbice. We left St. Cuthbert’s at 5 a.m. and didn’t get home until 7:30 p.m., so it was a very long day of traveling! We probably spent at least 8-9 hours driving, but it was definitely worth it! 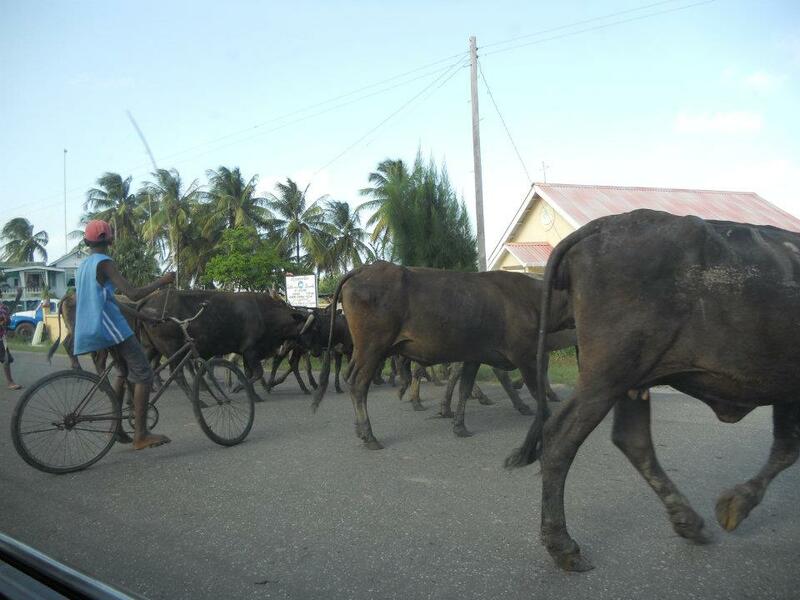 Berbice is made up of tons of small villages and a few towns, and most of the area is covered in farmland, as the main industry of this region is agriculture. We saw our fair share of donkeys, horses, goats, cows of all kinds, and sheep roaming freely across the roads, and often had to stop for them to cross in front of us! Given the speed of our driver, this wasn’t always easy, but luckily, we didn’t have any super close calls! There are also lots of sugarcane and rice fields here, and we got to stop off at a rice mill and a sugar processing plant to take some pictures. Some highlights of the day were crossing one of the world’s longest floating bridges over the Berbice River (Guyana’s second-largest river), and looking across the Corentyne River, which serves as the border to Suriname! I almost made it to another country, but not quite! Stopping for a cow crossing!